WISCONSIN RAPIDS – The Auburndale girls cross country program has built up into a force on the state level. The Apaches proved it Saturday, placing second in the Division 3 team standings at the 2018 WIAA State Cross Country Championships at the Ridges Golf Course. Auburndale was making its fourth-straight state appearance and continued its trend of improving each year. The Apaches placed 13th in 2015, ninth in 2016, and fourth last year, before this season’s runner-up finish. Among the runners on qualifying teams, Isabella Jewell placed ninth (20:20.0) and McKenna Zieher was 10th (20:21.4) to lead Auburndale. The Apaches finished with 91 points, 17 behind Lancaster, which was last year’s runner-up. Dodgeland took third with 147 points. Erricka Zenner finished 16th (20:44.9), Macie Schmeiser was 27th (21:04.7), and Jordyn Karl took 29th (21:06.3) to round out the scoring runners for Auburndale. In addition, Vanessa Mitchell was 31st (21:19.4) and Lily Kloos took 51st (22:06.1). Only Jewell, who was 26th overall in the race, is a senior among Auburndale’s seven state runners. 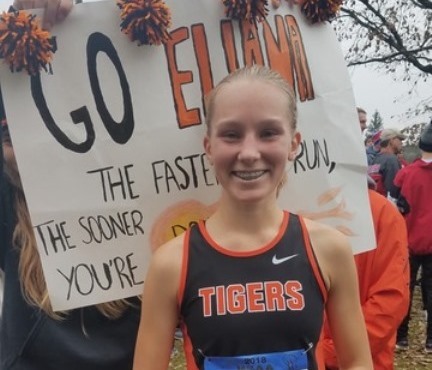 Edgar’s Marissa Ellenbecker repeated as the Division 3 individual state champion, winning the race in 19:06.4, 6.1 seconds ahead of Dodgeland’s Meygan Benzing. Loyal/Greenwood’s Savannah Schley finished 15th in 19:57.7. Marshfield had three runners take part in Division 1 races. Junior brothers Joseph and Joshua McKee ran in the D-1 boys race for the Tigers. Joseph McKee, making his second-straight state appearance, finished 38th in 16:28.4, 10 spots and 16 seconds better than in 2017. Joshua McKee finished in 91st among the 190 runners, running the course in 17:00.6. Freshman Eliana Kanitz ran in the Division 1 girls race for Marshfield, finishing 39th in 19:39.4 in her first state trip. Stratford junior James Heeg was also making his first state appearance. Running in the Division 3 boys race, Heeg finished 60th in 17:52.3. Neenah (Division 1), Valders (Division 2) and La Crosse Aquinas (Division 3) won the boys team titles. The title was Valders’ second in a row. For Neenah, it was its third all-time (1963 and 2001), and it was Aquinas’ second ever (2007). Individually, Mequon Homestead’s Drew Bosley repeated as the Division 1 boys individual champ, winning in 15:20.1. East Troy’s Henry Chapman took first in the Division 2 boys race in 15:59.3, and Onalaska Luther’s David Vannucchi won his third-straight Division 3 title, winning in 15:43.9. All three girls team champions won the title for the first time in their respective program’s history. Muskego won the Division 1 girls title, Medford took first in Division 2, and Lancaster was first in Division 3. Muskego won its first title in six state appearances, for Medford it was the Raiders’ first-ever state team appearance, and Lancaster was making its fifth state trip as a team. In addition to Ellenbecker’s win in Division 3, freshman Genevieve Nashold of Madison West won the Division 1 girls race in 18:10.0 and Leah Kralovetz of Denmark won the Division 2 race in 17:46.7, unseating two-time defending champion Dana Feyen of Gale-Ettrick-Trempealeau, who finished second 32.5 seconds behind. For complete results, courtesy of the WIAA, click here.